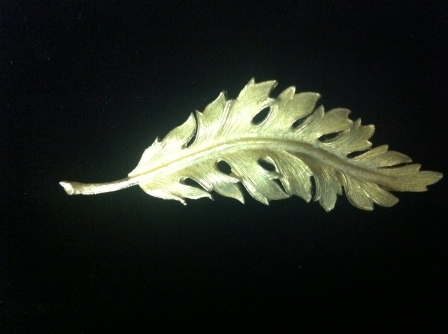 Gold feather or leaf pin/brooch signed by Coro. Coro, a partnership between Emanuel Cohn (the "Co") and Gerald Rosenberg (the "ro"), began producing jewelry in New York in 1901 and continued through the 1970s under the marks Coro, Coro Craft (later Corocraft), and Vendome, among others. Although Vendome was the company's high-end line, some of the most sought-after pieces today are the Coro pieces, especially the Duettes, the company produced in the 1930s and 1940s.